News on opening up of multi-brand retail segment to foreign chains is all over the place in today’s morning newspapers. Still, I would like to address a few important points over here for the benefit of our readers as to the fine print of FDI clearance in the sector cluttered by unorganized small kirana (mom and pop) shops. It has finally happened – India will see the foreign supermarket retail giants such as Walmart, Carrefour, Tesco Plc and others shaking to the tune of aspiring Indian consumers. Today, the organized retail market in India is estimated to be worth around $28 billion; and is projected to grow by 10 times by 2020. The Union cabinet on Thursday cleared FDI in the multi-brand retail sector to the extent of 51% stake for the foreign retailers. That’s not all – the government also went full throttle to allow 100% FDI in single-brand retail segment, from the prevailing 51% limit, to push niche luxury brands in making further commitments in growing market of India. However, there are no free lunches – the entry pass for the Indian disco party for the multinationals firms comes with riders to resolve certain structural inefficiencies in the supply chain; and develop post-harvest and cold chain infrastructure. Union cabinet clears 51% for multi-brand supermarkets. Minimum investment from foreign retailer is $100 mn. At least 50% of the total FDI must be invested in ‘back-end’ infrastructure. Minimum 30% of the local sourcing requirements from small industries. The govt will have the first right to procure agricultural produce. The investment needed for entering the sector has been fixed at $100 million in towns with population of more than 10 lakh as earmarked by 2011 census; half of which they need to allocate towards building back-end infrastructure and better logistical support for the exploding Indian retail sector led by burgeoning middle class population and growing consumer spending. Furthermore, the new guidelines may commit supermarkets run by foreign retailers to strict local sourcing requirements to the extent of 30% of manufactured or processed goods from small industries. Going by the 10 lakh population threshold to open supermarkets, 53 cities that accounts for over 42% of total urban population will be eligible to have internationally renowned retail outlets. Lastly, the cent percent opening up of single-brand retail segment will foster growth in India’s infrastructure for luxury retail markets such as jewellery, fine dining, luxurious real-estate, global branded apparels, yachts, and swanky hotels amongst other niche segment offerings. For a change, instead of ‘Made in India’; let’s say to them ‘Welcome to India’ ! 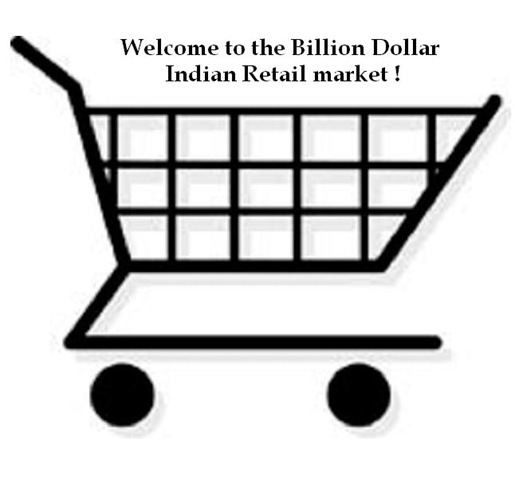 I want to get india retail segment about retail sector. Though the union government has given the nod for 51% FDI in retail but still the power is in the state government’s hand. In recent news, we heard that UP CM has opposed the government’s FDI policy and announced that she will not let this happen in Uttar Pradesh. The cap of 51% FDI and minimum investment of USD 100 million in Multi brands retail is for the benefit Biyani, Mittal, Ambani………..as only they could invest the balance 49% which works out to be Rs. 245 crores to partner with these retail giants. So we will have “Bharti-Wal-Mart”, “Future-Carrefour” and so on…………….We see them on the front page of all national newspaper supporting this move of the government. The government is telling us that these 51% and USD 100 million norms are to protect the Indian industry? Will this protect the Kirana or the big industrialist in India. The ruling party needs huge funds which will come from these Indian guys. However if we make it 100% FDI in Multi brand retail and no cap on investment then these same guys will oppose it tooth and nail. They will make sure that the government scraps it. The government should help Kirana / Small Traders to form co-operatives in the areas where Wal-Mart, Carrefour, Metro…….may be proposing to set up departmental stores. Let these co-operatives pick-up 49% in these operations. The political parties and Indian public has missed this point. No doubt this is a positive development for Indian economy. However we should not forget few facts. 1) Govt had not suddenly become wiser and realised what it is stalling for the last 8 years. It is only the recent crunch situation (falling rupee value, RBIs inability to intervene, FII pull out of dollars and the disparate need to attract forign investment) forced the Cabinet to sign the policy. 2) What ever the situation of govt what ever forced the govt to allow FID, it will bring sea changes to the way we Indians live. The middlemen involved in the present model of Kirana culture will be exposed. Earlier we were forced to depend on them. All the middlemen / brokers between the farmer and the consumer will be exposed. They either have to evolve to the new reality and get themselves involved in the new model or perish like pests. 3) When retail model was put forward, the middlemen opposed it even when the investors are Indians. Now when forign chains are being allowed also they raise hue and cry using front men like Vaiko in south and TMC in north and many others. Now farmers, SMEs can expect to be contacted by retail chains. They can expect better returns. 4) Back end infrastructure is a crucial area where Indians may try to make short cuts or bypasses but multinationals ar emore professionals and even if govt will not insist, they will follow international procedures. This is where India stand to gain. The professionalism in supply chain management which forign multinationals are expected to bring to India will make a cultural change. Warehousing, cold storages, transport will bring sea changes. 5) When 10 years down the line when people shop, they will realize what they were deprieved off all these years by kirana mafia. 6) The tight situation which forced stupid government to allow FDI in retail makes me think that if any policy need change, the govt has to face difficulties. Otherwise the MPs, ministers will simply sleep for 5 years. They need a kick in their backside to modernize India.